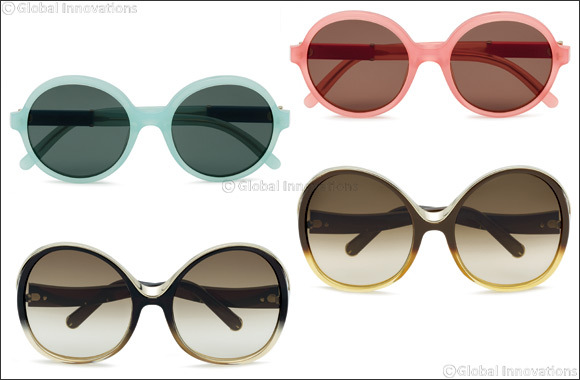 Chloé eyewear - Vintage inspiration, luxurious details & a seventies feel. Graceful and lightweight, Mandy sunglasses feature a ribbon-like metal detail that embraces and decorates the top of the lenses and rests on the temples like a sinuous wave. The contrast of materials and the gradient color of the front envelop this glamorous model in an enchanting harmony of light and shadow. The palette includes gradient Black, gradient Dove Gray, gradient Brown/Yellow and gradient Taupe. In line with current trends in ready-to-wear fashion, the design of Marlow sunglasses reflects the attitude of contemporary women who like bold, refined shapes. With its retro-chic style, the round oversized frame featuring a very high bridge fully embodies the Chloé spirit. Assertive acetate features are softened by gradient lenses and gold metal plates that embellish the temples and incorporate the hinges and the engraved logo. Available in Black, Tortoiseshell, Rust Brown and Light Havana. One of the brand’s most iconic models, Myrte has been redesigned with fine lines and light nuances that give these sunglasses new allure. The round oversized silhouette adds a precious, delicate look. Four gold plated clips enrich the profiles of the gradient lenses, while the deliberately minimalist design of the metal temples enhances the richness of the front. In this original restyling, the clear plastic frames come in alternating Dark Gray, Caramel, Taupe, Khaki, and Peach. The optical version of the Myrte model features a modern, clean and minimalist design with round-shaped, oversized proportions and Seventies inspiration. The Chloé logo is discreetly etched on the thin metal temples. Available in the brand’s iconic colors: Burgundy, Peach, Dark Gray and Havana.